Sometimes, you just have better things to do than cook. In my case, it involved rowing, and dancing on translucent floors with sharks swimming below, not necessarily in that order. But, a girl has to eat, particularly before swilling Belvedere and cranberry juice, (also gluten-free) over said sharks–this isn’t a recipe, so much as a plan to avoid a hangover. A day before you’re planning on making the wings, take some out of your bag of frozen wings, and put them in the refrigerator to thaw. 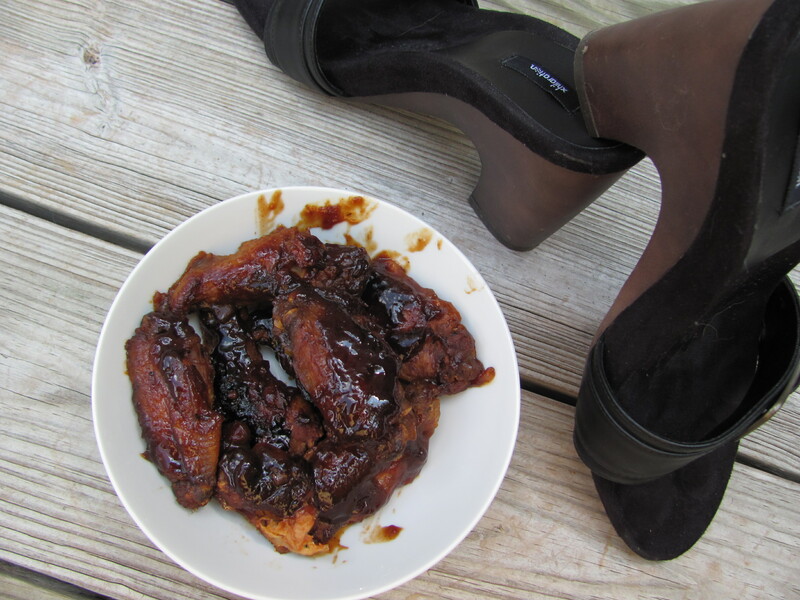 At lunch on Friday, take the wings out of the refrigerator, and put them in the crock pot on high. * Pour barbecue sauce, and a cup of water over them, enough to cover. Plan to leave the wings for at least four hours, and go back to whatever you’re doing, in my case, wreaking mayhem and havoc, practicing my shimmy, and painting my nails. When it’s time to start doing your makeup, remove your toaster oven pan from the toaster oven. Turn the knob on the toaster oven to “broil”. Line the toaster oven pan with tin foil and remove the now-falling-apart wings carefully from the crock pot. Pour more barbecue sauce over the wings. Put the toaster oven pan full of wings into the toaster oven and broil for eight to twelve minutes. Cool while you decide whether to go with the three or five inch heels. *Food safety note: If you have older crock pots, or you’re not sure which one in your vast collection of crock pots has a higher temperature, go with the one that will nuke the chicken. Salmonella is no fun.